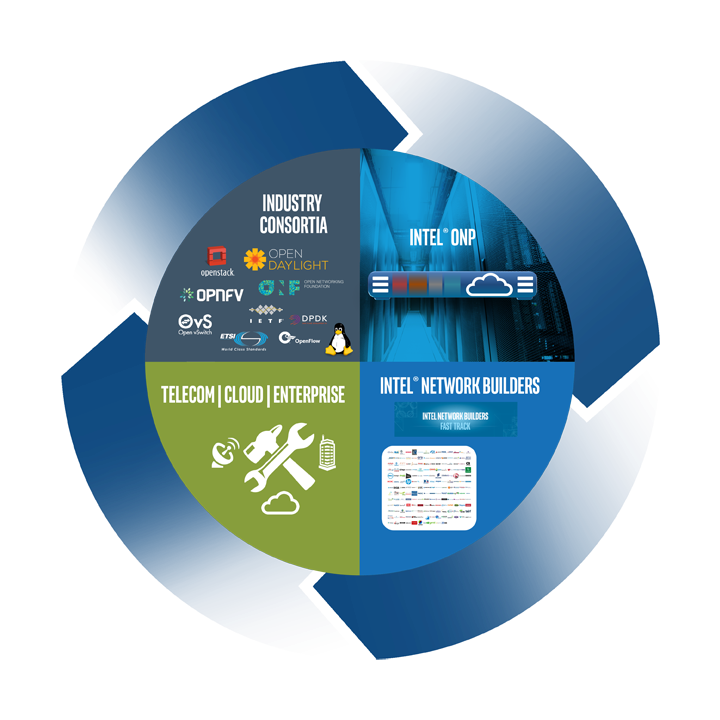 Intel® Open Network Platform (Intel ONP) is a reference architecture that provides engineering guidance and ecosystem enablement support to encourage widespread adoption of SDN and NFV solutions in Telco, Enterprise and Cloud. It is not a commercial product, but a pre-production reference that drives development and showcase SDN/NFV solution capabilities. Intel ONP reference architecture brings together Industry Standard High Volume Servers (SHVS) based on Intel® Architecture (IA) and a software stack composed of open source, open standard software ingredients. One of the key objectives of Intel ONP is to align and optimize key Open Community software ingredients for architects and engineers targeting high performing SDN and NFV open source based solutions. Primary Intel ONP Software Ingredients included are: DPDK for accelerated packets processing; Open vSwitch* (OVS) including support for OVS with DPDK which enables much better performance of the data plan when using DPDK libraries; OpenDaylight* (ODL) controller; and OpenStack orchestrator. This new release of the Intel® Open Network Platform (Intel® ONP) introduces new functionality, enhanced performance, and greater stability. Support for the recently introduced Intel® Xeon® processor E5-2600 v4 is included, the 3rd dual processor server platform tested for Intel® ONP. Support for the Community Enterprise Operating System (CentOS*) is now available with improved network interoperability through integration with the latest open-source ingredients. The Intel ONP reference architecture drives SDN/NFV network transformation by addressing the commercial needs of diverse industry sectors. Intel ONP release 2.1 is delivered in the form of a software script and a comprehensive set of supporting reports that available to download from this web page. Release highlights, new features, limitations and recommendations in addition to the release documentation. These notes detail the relevant technical information for each release. Provides guidelines for configuring and installing the Intel ONP software stack. The software is running on a cost-effective SHVS based on Intel architecture. Provides performance test results for Intel ONP release 2.1 software on the Intel® Xeon® processor E5-2600 v4. Provides a technical description of the use of Intel® Resource Director Technology (RDT) on the Intel® Xeon® processor E5-2600 v4. These notes detail the differences in hardware components and software versions between Intel ONP Release 2.1 Reference Architecture Guide and Intel ONP Release 2.1 Performance Test Report. Provides guidelines for configuring and installing the Intel ONP software stack and for validating the software in an SDN test environment. The software is running on a cost-effective SHVS based on Intel architecture. Provides performance test results for Intel ONP release 2.0 software on the Intel® Xeon® processor E5-2600 v3 product family and provides performance test results for the Intel ONP release 1.5 software on Intel® Xeon® processor D-1500 product family. Provides a technology overview, industry status and gaps assessment, and complete technology evaluation when using the Intel ONP reference architecture. Intel® ONP Release 2.0 Application Notes Technical notes, instructions and recommendations in addition to the release documentation. Performance characterization and baseline performance data based on ONP release 1.5 software. Integration activities were done on the configuration in the ONP Server Release 1.5 Reference Architecture Guide. Benchmarking activities were done on the configuration in the ONP Server Release 1.5 Benchmark Performance Test Report. The Application Note contains information on the differences between these two configurations. Description Intel ONP Server Release 1.3 archived benchmark Performance document, used as a baseline for performance comparison.